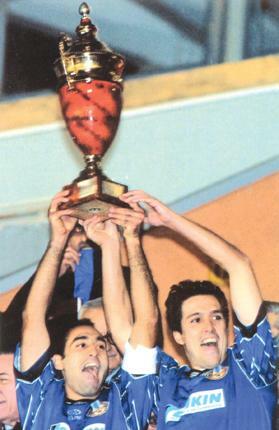 Noel Turner (left) and Brian Said lift the Super Five Cup in 2002. In the past, Maltese football was no stranger to controversy. Many were the incidents and polemics that marred the game on our islands but the ones that marked the 1990-91 champion-ship take some beating. It is enough to say that the relegation issue was not decided on the field of play but on the Protests Board’s table. The league campaign ended with Naxxar Lions being relegated to the second division in a bizarre and hotly-disputed finale. However, this incident is not the subject of this week’s story. This time I chose another episode that occurred during that unhappy season. During the 1990-91 season,the MFA, in conjunction with the Ministry of Finance, introduced a new competition sponsored through the profits of the Super Five lottery. This pre-season tournament was open to the teams that finished in the first four places in the previous league campaign. The new competition kicked off on August 17, 1990. In the first game Ħamrun Spartans suffered a humiliating 4-0 defeat against Valletta. The Spartans’ defence could not keep up with the lethal striking duo of Jesmond Zerafa and Joe Zarb. The former stole the show with his dazzling dribbling as time and again he left the Reds’ rearguard in disarray. Zerafa’s scintillating performance was rewarded with three goals. Zarb was also a constant threat and crowned a brilliant performance with a goal from a penalty late in the second period. On the same afternoon, Sliema Wanderers reached the final of the tournament with a 1-0 victory over Hibernians. It was a merited victory for the Wanderers. The Blues shared the exchanges with the Paolites in the first half but in the second period they gained control in midfield. The inaugural Super Five tournament was overshadowed by a dispute between the MFA and the referees over the staging of matches in open grounds. The Malta Referees’ Association requested more protection for its members and when this was not forthcoming, the referees were ordered to go on strike. In retribution, the Malta FA withheld the referees association’s recognition. As a result of this row, three British referees arrived in Malta to control matches from the pre-season tournament. The MFA acted in great secrecy and when the referees walked onto the pitch to control the Sliema-Hibs encounter their names were still not available to the press. It was only a matter of minutes before the referee was identified as R. Milford while P. Alcock and C. Henderson were the two linesmen. The afternoon went by quite smoothly with the British officials controlling the game to perfection. Fortunately, the dispute did not escalate. After a few days, an agreement was reached and the Maltese referees returned to their duties. After their superb performance against the Spartans, Valletta were firm favourites to beat the Wanderers in the final. The Citizens, however, had no answer to the sharp running of Hubert Suda, the trickery of Martin Gregory and the intelligent play-making of Michael Taliana. This trio were in remarkable form and, helped by the rest of the team, they swept away any hopes Valletta may have had of winning the new trophy. Sliema won a rather one-sided game 3-0 thanks to a Gregory brace and an own goal by Joe Camilleri. The tournament lasted 16 seasons before it was scrapped. Valletta and Floriana won the tournament four times each. Sliema and Birkirkara had three victories and Hamrun and Hibs won it once. In 2006, the MFA replaced the Super Five tournament with a quadrangular tournament for the top clubs. This pre-season competition was only held once and it was won by Hibernians.